Click the image to the left or the link below to download the Exhibitor Handbook for this event. Please read through the entire handbook and plan your booth design accordingly. All the important times, dates and locations are included. If you have any questions about anything in the handbook, please let us know as soon as possible. We want the show and move-in/move-out to go as smoothly as possible! 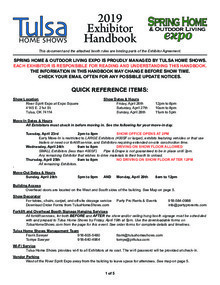 Download "SHE19 Exhibitor Handbook Pg1-5.pdf"